Instead of using Google Earth on a browser, you can download Google Earth Pro for Windows 10 and use Google Earth software directly from the desktop of your Windows 10 PC. Here’s how to download Google Earth for Windows 10 64 bit or 32 bit offline installer for free. Google Earth is a free software developed by Google that allows you to view the Earth with high-resolution images. It is far superior than basic static maps and old satellite images. The images can be so detailed that you can clearly see your house, car and people on the streets. However, high-resolution images are usually only available in large and populated cities, whereas low populated or inhabited area generally have lesser quality graphics and images. 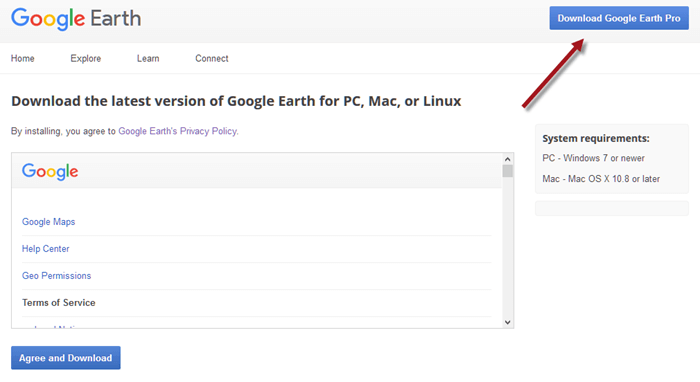 Before the release of Google Earth Pro for Windows 10, the only way to use Google Earth is through browsers that supports Adobe Flash player such as Google Chrome, Mozilla Firefox, Microsoft Edge or Internet Explorer, by visiting https://www.google.com/earth/. Since Google Earth is also available for desktop PC now, you might as well download and use it directly from your computer instead of having to open a browser to use it. If the Google Earth download doesn’t start after clicking the Agree button as if nothing has happened, click on the Download Google Earth Pro button at the top right corner of the page. Then, click on Agree again. The Google Earth download for Windows 10 should start in a few seconds. 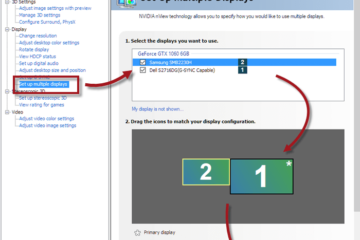 The Google Earth download for Windows 10 link shown above will only download a web installer that requires internet connection to run in order to install Google Earth on your computer. 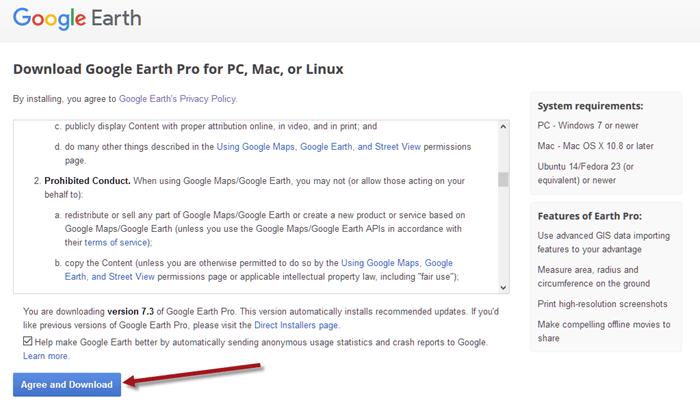 If you want to install Google Earth on a PC that don’t have any internet connection, you may need to download the Google Earth Pro full version for Windows 10 offline installer. To download Google Earth for Windows 10 offline installer or old versions of the program, go to this page. On the webpage, click on the Download a Google Earth Pro direct installer link to expand it. Select your desired version of Google Earth that match the architecture of your computer’s operating system. 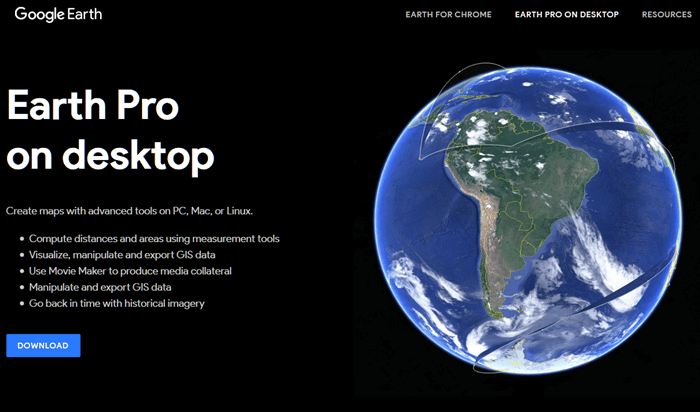 The latest version of Google Earth Pro will usually be listed at the top of the list. You can also use these Google Earth download for Windows 10 offline installers to manually update your Google Earth when auto-update is disabled. Google Earth is the name of the technology and the program. Google Earth Pro, on the other hand, is basically the same thing except it’s made for Windows, Mac and Linux desktop computers. 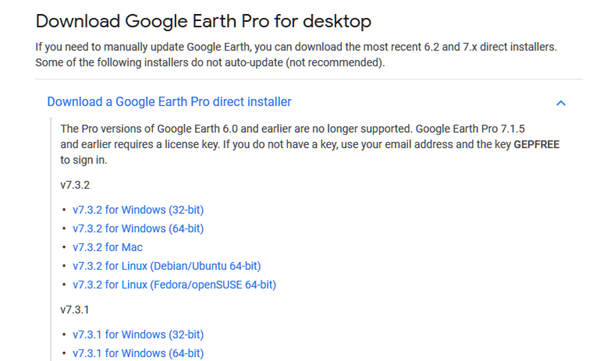 So, when you download Google Earth for Windows 10 PC, you are actually downloading Google Earth Pro, which is the name of the version made solely for desktop computers. Do I need internet connection to run Google Earth Pro on Windows 10? As you may have already noticed that the Google Earth Pro software installation is relatively small in size. The installation includes only components needed for Google Earth Pro to run. It doesn’t contain any images of the Earth. The images are stored on Google’s servers and will only be streamed to your PC upon demand. So, the answer is yes. You will need internet connection in order to load images as you view the Earth in Google Earth Pro for Windows 10. Description for sharing: Google Earth Pro free download for Windows 10 64 bit or 32 bit offline installer 2018, allowing you to view the Earth via high-res 3D images.